If you’re in the market for a blast of aggressive but witty R’n’B, then look no further. 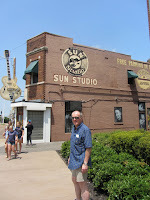 As English as cod and chips, Big Boy Bloater majors on the kind of collision between Chicago R’n’B and Chuck Berry rock’n’roll evident in both early Stones and the Feelgoods. His 2016 outing Luxury Hobo showed him throwing his own twists into that mix, and Pills repeats the trick. some classy female harmonies that provide extra oomph. ‘The Saturday Night Desperation Shuffle’ is the real winner though. A ‘Ballroom Blitz’-like drum rhythm from Matt Cowley sets the tempo, matched by fast-striding bass from Oates, over which the Bloat lays an urgent guitar riff, and a spiky solo. And while he may not carry the air of menace that Lee’n’Wilko conjured up, he does offer a wry line in observational lyrics. Pub rock, we’re often reminded by those who were there, wasn’t a sound or a scene, it was just rock music being played in a bunch of London pubs by a variety of different bands. It’s striking though, that when Bloater departs from the forceful R’n’B template, he’s liable to come up with the bobbing Anglo-Country that is ‘Stop Stringing Me Along’, a tale of relationship failure with acoustic strumming and ooh-oohing female backing vocals, that recalls another pub rocker, Nick Lowe. ‘Oops Sorry’ is a bit of lightweight rock’n’roll that’s also in Lowe territory, both musically and lyrically. A whimsical tale of heartbreak that extols the merits of Gaffa tape and super glue, it features chiming piano and a Latino guitar solo. And just to round out the pub rock comparisons, ‘Slacker’s Paradise’ is a skipping effort initially redolent of Graham Parker, and a witty vision of consummate idleness with perfectly matched laid back accompaniment. The back end of the album may contain some efforts that don’t quite hit the bullseye, like the ultimately inconsequential ‘Mouse Organ’, with its inflections of European jazziness, or the closing ‘A Life Full Of Debt’, a melancholy tale of consumerism based on ukulele strumming. And while ‘The Digital Number Of The Beast’ is a humorous take on “the rise of the machines”, pinging out some musical binary code, it lacks the focus on display elsewhere. But hey, there’s still room for the quintessentially Bloaterist ‘Unnaturally Charming’, a spooky B-Movie yarn about a young man whose easy charm masks a dangerous misfit, with swirls of fairground organ in the background, jagged guitar counterpointed by more female backing vox, and closing out with a repeated, Dan Auerbach-like guitar lick. Big Boy Bloater ain’t no teenage guitar hero. He’s not trying to make some clever crossover into another market. His act is founded on down to earth elements of rock’n’rollin’ directness, delivered with wit and imagination. He takes some basic R’n’B virtues, and turns them into something as fresh as a mug of whelks. Go get a fork and dig in. Pills is released by Mascot Label Group on 15 June. 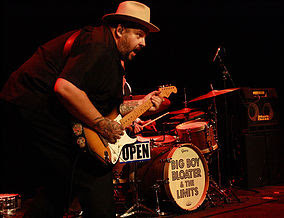 Big Boy Bloater tours Britain in September and October - details here.